From Summer 1995: the sixth issue of THE 5 TIMES, the newsletter of the unofficial BABYLON FIVE FAN CLUB. From memory, I think the "missing" fifth issue was a 'bonus' issue which included a few pages of original content and a newly drawn (and rather nice) cover and binding for the first season episode guide published across the first four newsletters. 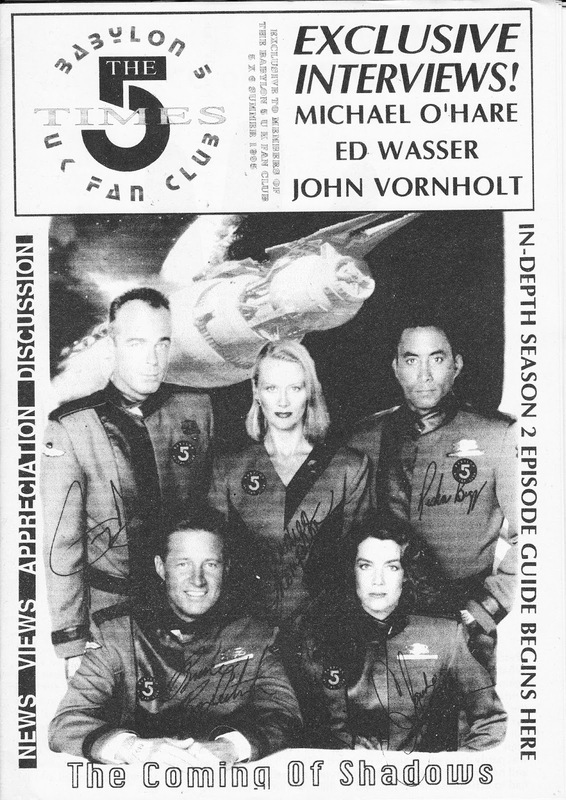 The impressive-for-a-fanzine number of original interviews in the newsletter can partly be attributed to the club's semi-official status and the frequency of appearances by assorted cast members in the UK. In retrospect, has there ever been another US genre show with a cast and crew quite so accessible to British fans and fandom?
" Babylon 5 was all the rage in the uk, the absolute rage, more popular than star trek even. " It was truly the show that burned twice as bright but half as long. the new issue of HORRORVILLE is also out a week early.